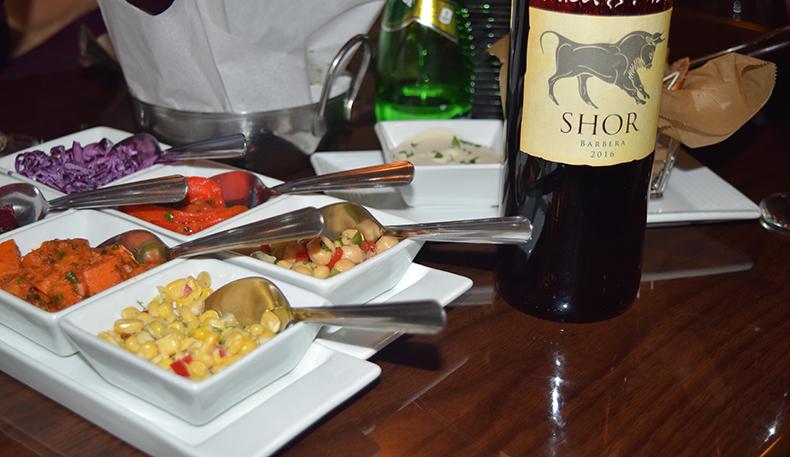 Israeli Hummus- Homemade hummus served with warm pita bread. Hummus with Mushrooms- Homemade hummus served with warm pita bread. Hummus “Masbacha”- Homemade hummus served with warm pita bread. Hummus “Ful”- Homemade hummus with broad beans served with warm pita bread. Falafel Plate- Falafel balls accompanied with homemade tahini sauce. 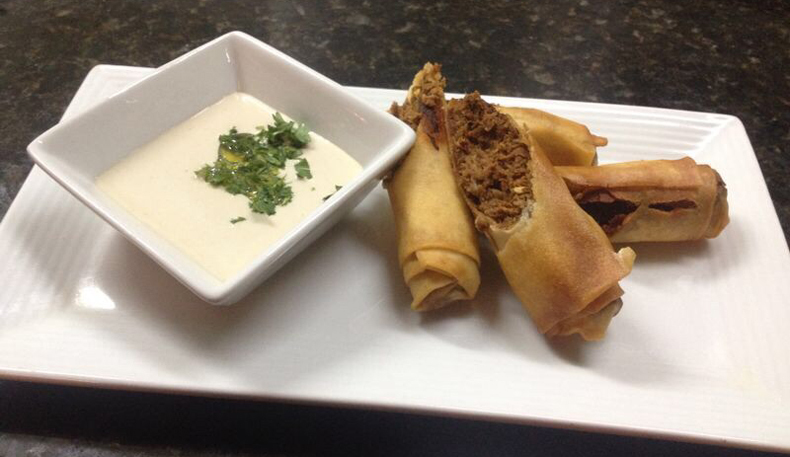 Grill House Cigars- Chopped beef with garlic and onions inside crispy thin skinned cigars, served with homemade tahini sauce. 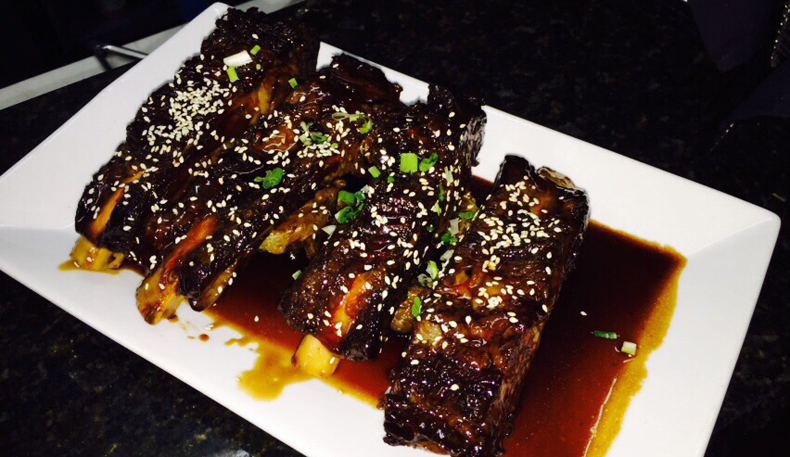 Baby Lamb Spare Ribs- Baby lamb marinated in Korean sauce. 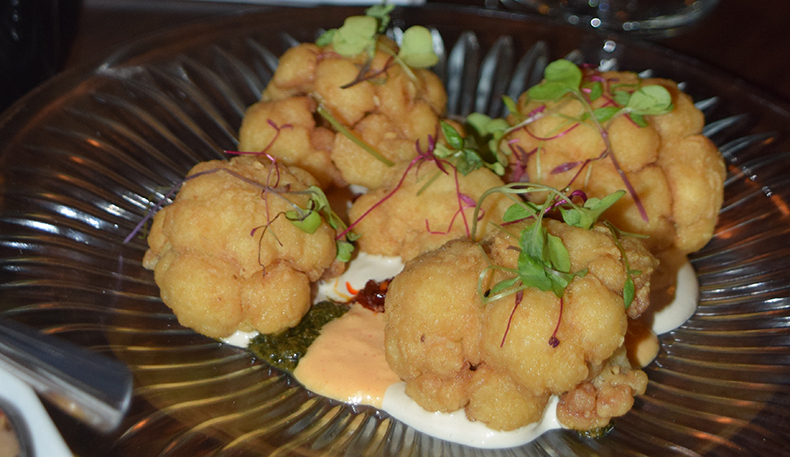 Chicken Drummettes- Drummettes marinated in a sweet and spicy sauce. “Baladi” Grilled Eggplant- A whole eggplant grilled and served on top of homemade tahini sauce, with olive oil and parsley. 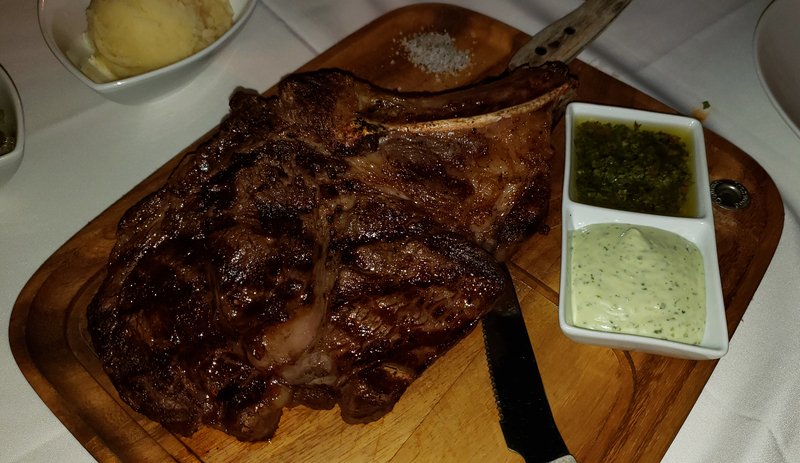 “Bone” Rib Eye- Boned rib eye steak grilled to your preference. 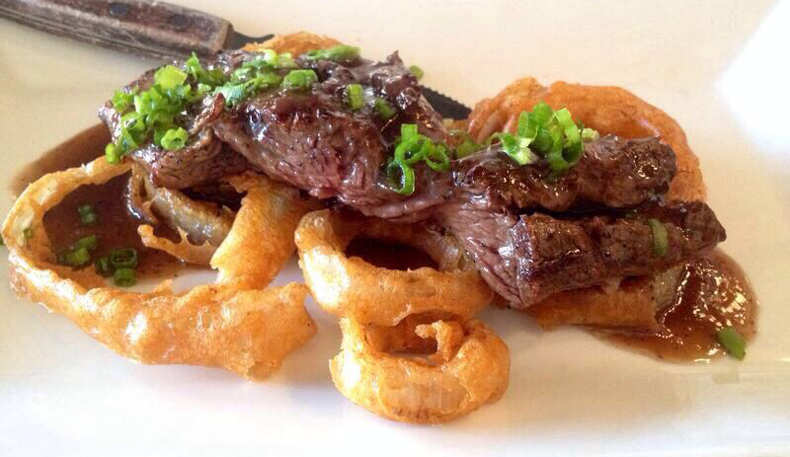 Rib Eye Steak- Aged rib eye steak grilled to your taste of perfection. Moroccan Tilapia- Tilapia marinated in a Moroccan sauce with chick peas, red pepper, garlic, cilantro and tomato. Oriental Crusted Salmon- Baked salmon coated in garlic and walnuts prepared with a mango salsa and teriyaki sauce. Italian Provençale Salmon- Salmon sautéed with white wine, tomato, black olives, garlic and olive oil. Ginger and Soy Salmon- Salmon made with our homemade ginger sauce, soy and scallions. Beef Kebab- Homemade ground beef, seasoned and mixed with onion and parsley. Baby Chicken Skewers- Tender dark meat chicken on the grill. .
Chicken Breast Skewers- Chicken breast on the grill. Beef Fillet Skewers- Lean and tender meat on the grill. Butterfly Chicken- Grilled Chicken breast marinated in garlic and onion. Satay Teriyaki Chicken- Sauteed vegetables slightly caramelized in a sweet sauce, prepared in a Japanese style. Chili Chicken- Chicken breast prepared with a sweet and spicy sauce on the grill, drizzled with sesame seeds and scallions. 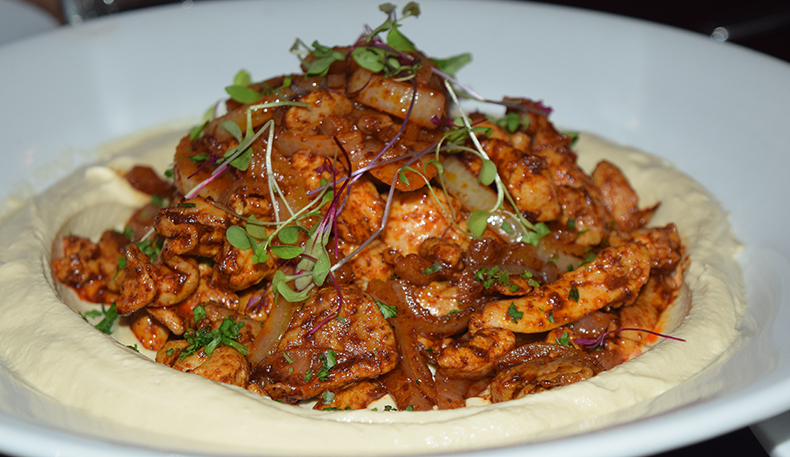 Jerusalem Mix- A variety of meats mixed with sauteed onions with homemade spices and served with a garnish of hummus. 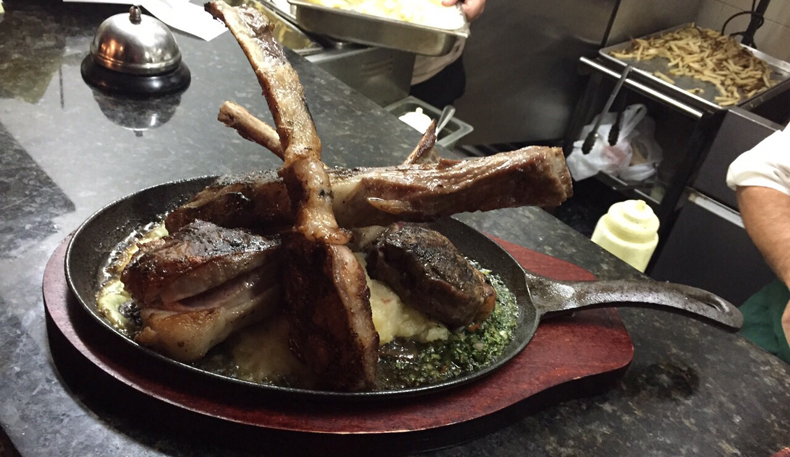 � How was your last visit to Grill House? 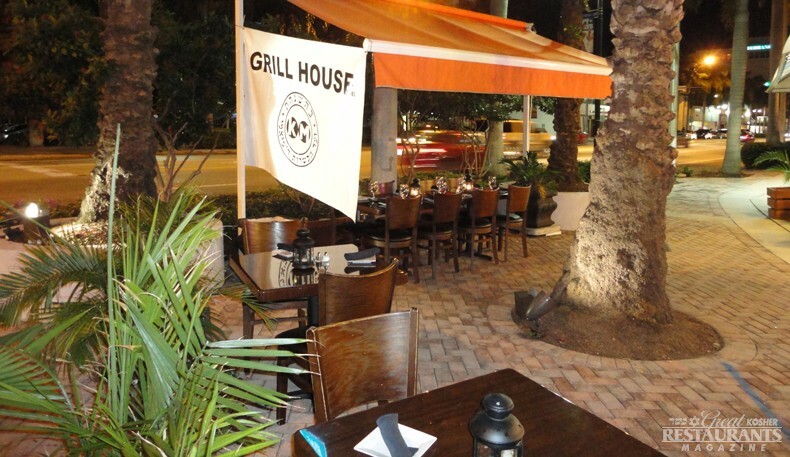 Sensing the need for a gourmet, Mediterranean style restaurant in Miami Beach, owner and chef Shimi Alon, opened the Grill House in September 2011. 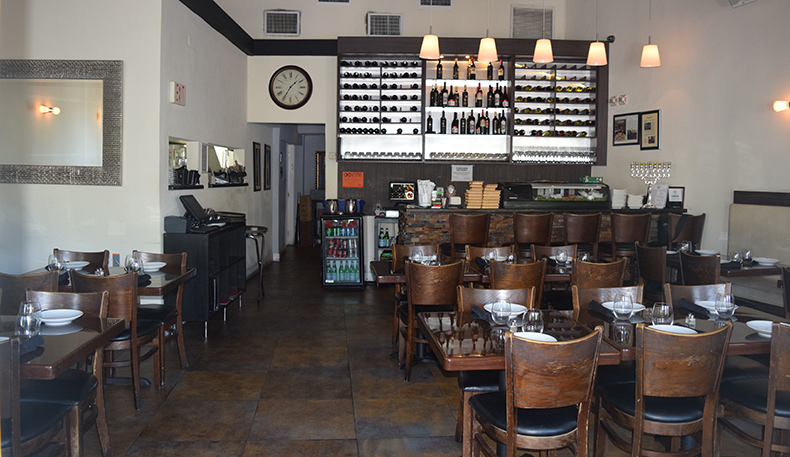 They are the first kosher restaurant when entering Miami Beach from the airport, which is quite important especially when you are hungry and you have just flown in. The restaurant features a modern beige décor including; high ceilings, dark wooden tables and chairs as well as private booths. Calming background music adds to the overall ambiance. They also have a beautiful outdoor patio, the largest of any restaurant in Miami, and perfect for all year round. 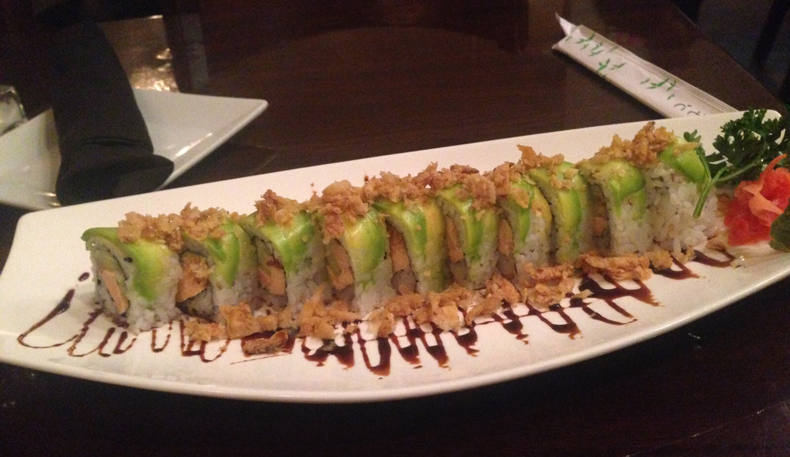 But it’s Chef Shimi’s food that people say is perfect. His philosophy is that using high quality, gourmet ingredients combined with a “home-style” atmosphere, will produce an excellent result. Chef Shimi is an Israeli trained chef with experience in both large scale catering as well as in a variety of restaurants. 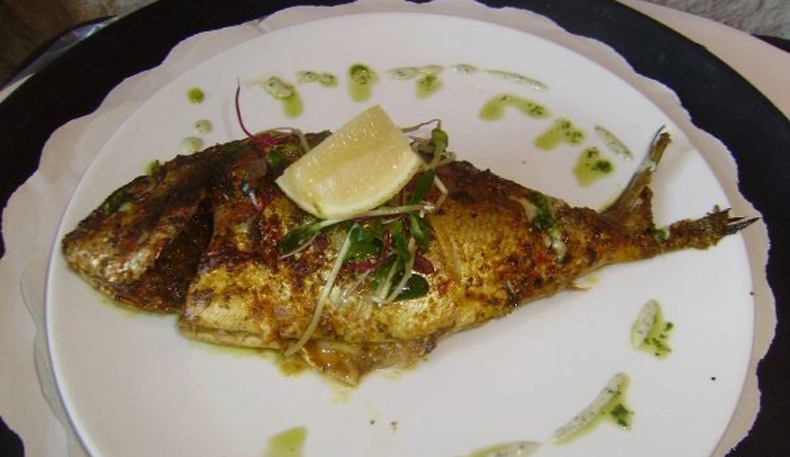 The variety of Mediterranean dishes leaves one’s taste buds overjoyed. Specialties of the house range from Satay Teriyaki chicken, Asian Korean steak, Moroccan Meatballs, and Baby Lamb Chops. 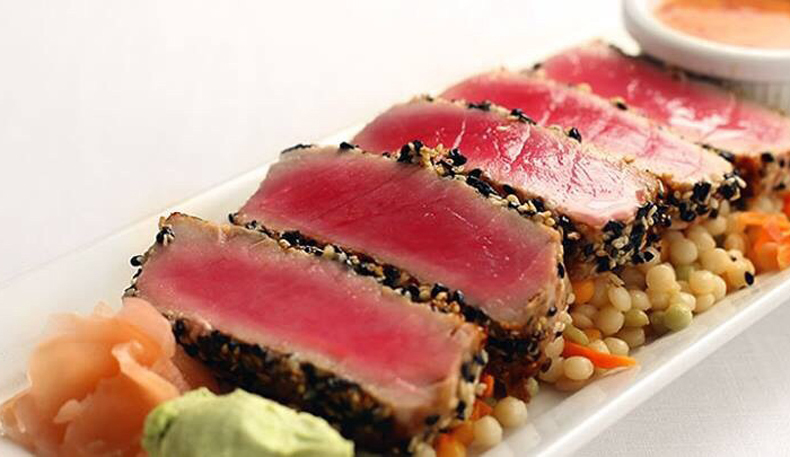 Before indulging in the main course, however, one has a choice of many of the delicious appetizers (Grill House cigars, Avocado eggrolls, or sushi) or the choice of dozens of fresh salads prepared daily. You can enjoy a glass of wine with your meal before finishing with either a homemade chocolate soufflé or apple tart or any of the other delicious desserts. The Grill House takes every measure to make its patrons feel comfortable. 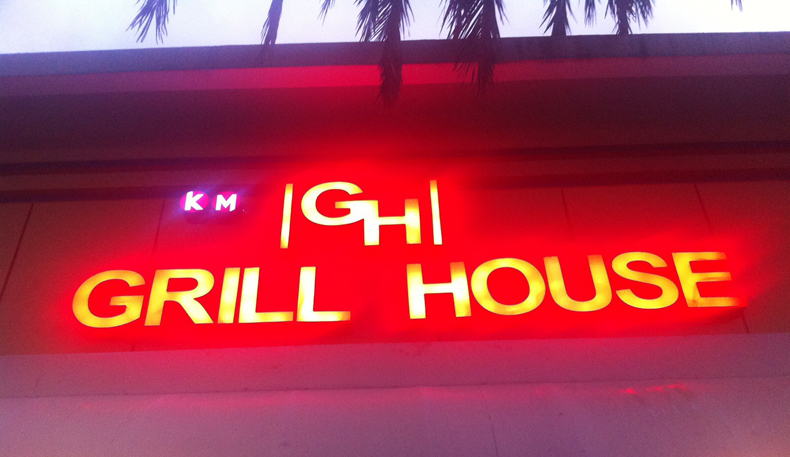 This effort was noticed by the city of Miami Beach who awarded a “Certificate of Recognition” to the Grill House. just ordered in food at Grill house, ordered it at 8:15 pm had it at my door 45 minutes later. They were proffesional over the phone, had excellent food, nice portions, very flavorful, and fair on price out of 5 stars i would give them a 4.5 Good job, Great Food, Good Service, would definitley recoemnd to others, try the thai beef salad excellent.